Catania is dramatically situated between the Ionian Sea and Mount Etna, Europe's greatest active volcano. As well as ruins from the ancient city, the town boasts a wealth of fine Baroque architecture. Some visitors love Catania, others - generally those who pass through briefly - hate it. It's a city with a strong personality, dominated by the looming bulk of Etna, which every so often rains ash upon the streets. The city has a lot to offer tourists, though, and has recently been making an increased destination to promote itself as a tourist destination, and not just a base for seeing the legendary volcano. One of the most significant events which shaped Catania was the earthquake of 1693, which devasted most of south-eastern Sicily. The town was re-built in the Baroque style, and it was during this era that many of the town's finest buildings came into being. Founded by Greek colonists, Katane was subsequently conquered by Syracuse and then, during the Punic Wars, by the Romans. One of the best Roman structures that can still be seen is the Roman Theatre in Via Vittorio Emanuele, surrounded by later buildings. Next door is the round Odeon, a smaller auditorium. Close by in Via Rotonda, the church of Santa Maria della Rotonda is founded on the remains of Roman baths. The lava-and-marble Roman Amphitheatre, part of which can be seen in Piazza Stesicoro, dates to the second century AD. Among Catania's more recent sights are the many Baroque churches and palazzi, including the heavily-peopled facade of Palazzo Biscari. The Museo Civico in the stumpy grey fortress of Castello Ursino (1239-1250) houses a range of exhibits from all eras of Catania's history. Piazza del Duomo is Catania's principal square, at the end of busy Via Etnea (named for the volcano), and most of the town's tourist attractions are close by. In the centre is a much-photographed eighteenth-century lava statue of an elephant, supporting an Egyptian obelisk. The Duomo itself is one of Catania's grandest sights. The facade dates from the Baroque rebuilding of the town, although some of the earlier church did survive the earthquake. Remaining sights to see in Catania include the black-and-white Porta Garibaldi and the striking uncompleted facade of the Chiesa di San Nicolo in Piazza Dante. The town's theatre, Teatro Massimo Bellini, has a grand frontage and a lavish interior. Its name honours local hero Vincenzo Bellini (1801-1835), the composer whose opera Norma gives its name to one of the culinary specialities of the region. The Museo Civico Belliniano (Piazza San Francesco 3) is free and contains mementoes from all stages of the composer's short life. Also named after him is an ornamental public park, Villa Bellini. Etna is the highest European volcano, its vast bulk bolstered by millennia of eruptions. 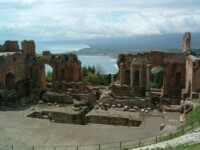 Catania makes a good starting-point for volcanic excursions. The small towns around the National Park are interesting and worth touring if you're spending some time in the area. Visiting the volcano itself is dependent on current conditions. There are various organised tours of the volcano - check at Catania's tourist office (Via Cimarosa 10) to find out about these. They will also be able to give you advice on conditions around the craters. The Circumetnea is a small railway line which circles the base of the volcano, leaving from Catania and terminating in Riposto (where you can catch a mainline train back to town). There are several high-altitude spots which can be reached by car or public transport, the highest being Piazzale del Rifugio Sapienza. Catania is on the main Messina - Siracusa railway line, and is thus connected by direct trains to mainland Italy. Buses as well as trains serve local destinations, and urban buses cover the built-up area. Catania also has an airport. > Catania hotels, B&Bs and holiday apartments.